Our model is to provide students with the tools to increase self-awareness and build their personal brand. Career Services can help with updating resumes and LinkedIn profiles that speak to core strengths and achievements. Our mission is to help students build their network through informational sessions, networking events, and alumni gatherings. Presidio Graduate School supports students and alumni/ae to help them identify and pursue fulfilling, mission-driven careers that are consistent with their values and priorities. Our Career Development and Student Affairs team offers a range of programs including career development coaching, workshops, panel presentations, and networking opportunities. At PGS, career services are integrated into the overall learning experience. Students are challenged in the classroom to build their self-awareness in parallel with their business acumen. Our graduates practice what they preach – and employers notice it. Alumni are engaged in a myriad of industries, with the most common being food systems, business consulting, sustainability, energy, finance, media, and education. Some graduates choose to start their own ventures, while a majority bring a spirit of intrapreneurship to existing organizations. The CAIRs program includes career coaching and access to professional networks in a variety of disciplines and industries. These professionals are available to meet with students during and in between residencies and are typically a seasoned sustainability professional who possesses a wide professional network in the sustainability field. Each mentor is appointed on a term or year-long basis. We secured financial support to sponsor summer 2017 internships and fellowships for current students with agencies, social impact firms, and community-based organizations who are leading local, national, or global change. We encourage student participation in organizations for co-curricular development of interests that can help each student better formulate his or her ideal career path. There are many organizations to choose from in Seattle and San Francisco. Students and alumni are encouraged to take advantage of one-on-one career coaching with staff. You may register for a one-on-one career services session with our Director of Career Services, Sharmila Singh here. Each student enrolled in a degree program receives a complimentary membership to Net Impact or American Society of Public Administration, high-profile associations with thousands of socially committed member professionals. Central to our mission is providing opportunities for networking among students, faculty, staff, board members and our organizational partners. Presidio facilitates networking through community events, showcases, conferences, and introductions to professionals and organizations relevant to individual student career development goals. The Presidio Graduate School Inspiration Strikes Fund (ISF) underwrites costs associated with conference attendance for current students and alumni. More information about the fund can be found here. Updated job announcements are continually posted for positions across all sectors and industries and from around the world. Presidio works collaboratively with organizations, such as MBA-Nonprofit Connection, to identify job and career opportunities for our community. We invite private sector, governmental and civil society, and non-governmental organizations to join the growing Presidio Graduate School collaborative network. Our MBA, MPA, Dual Degree, and Executive Certificate students and alumni are well positioned to meet your recruitment needs and to excel in your organization. More specifically, whether it’s through experiential learning projects, internships, or full-time employment, our students (and alumni) possess professional acumen and multidisciplinary grounding to help you address your mission-critical sustainability, management, leadership, and innovation challenges. Our MBA, MPA, Dual Degree, and Executive Certificate students and alumni are well positioned to meet your recruitment needs and to excel in your organization. Whether it’s through experiential learning projects, internships, or full-time employment, our students (and alumni) can help you address your mission-critical sustainability, management, leadership, and innovation challenges. To learn more about bringing Presidio Graduate School students and alumni into your organization, contact Associate Director of Student/Alumni Affairs and Career Development Sharmila Singh. Thanks to the generosity of partner organizations, Presidio Graduate School offers students stipends to complete summer internships with cutting-edge organizations. Funding from the Betsy and Jesse Fink Foundation in 2012 and 2013 allowed our students and recent alumni to work in the impact investing field in positions with organizations such as RSF Social Finance, Sonen Capital, Mission Investors Exchange, and MissionPoint Capital Partners. 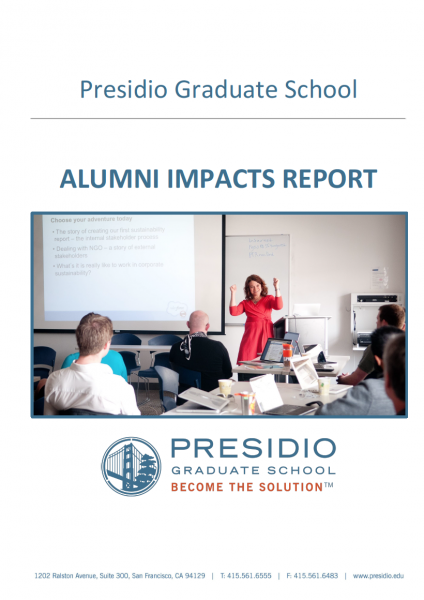 Click here to learn more about specific impact investing projects completed by Presidio Graduate School students. A generous grant from Invoking the Pause allowed two Presidians to complete projects with Environmental Entrepreneurs in 2013. Their work involved marketing, branding, and policy development in conjunction with the organization’s Global Warming Solutions Act (AB32) activities. For more information about our funded internships program, contact Director of Student/Alumni Affairs and Career Development Sharmila Singh. Do you have a position that you'd like to promote to our students and alumni/ae?